Chicago ’05 ended a couple of weeks ago. This was the sixth Machine Learning Summer School, and the second one that used a wiki. (The first was Berder ’04, thanks to Gunnar Raetsch.) Wikis are relatively easy to set up, greatly aid social interaction, and should be used a lot more at summer schools and workshops. They can even be used as the meeting’s webpage, as a permanent record of its participants’ collaborations — see for example the wiki/website for last year’s NVO Summer School. Other useful forums to set up are “Lost and Found”, and discussion lists for lectures — although the latter only work if the lecturer is willing to actively answer questions arising on the forum. You can set forums up so that all posts to them are immediately emailed to someone. Menus. You can set up the overall layout of the webpage, by specifying the locations and contents menus on the left and right of a central `front page’. This is done via the use of `modules’, and makes it possible for your wiki pages to completely replace the webpages — if you are willing to make some aesthetic sacrifices. Different levels of users: The utopian wiki model of having ‘all pages editable by everyone’ is … well, utopian. You can set up different groups of users with different permissions. Image Galleries. Gunnar got this working at Berder, where it was a huge success. Photographs are great icebreakers, even the ones that don’t involve dancing on tables. Surveys. These are easy to set up, and have option for participants to see, or not to see, the results of surveys — useful when asking people to rate lectures. TikiWiki also has several features that we didn’t use, such as blogs and RSS feeds. It also has a couple of bugs (and features that are bad enough to be called bugs), such as permission issues and the inability to print calendars neatly. These will doubtless get cleaned up in due course. Finally, owing to much prodding from John and some other MLSS participants, I’ve written up my experiences in using TikiWiki @ Chicago ’05 on my website, including installation instructions and a list of “Good Things to Do”. This documentation is meant to be a survival guide complementary to the existing TikiWiki documentation, which can sometimes be overwhelming. The diagram above shows a very broad viewpoint of learning theory. A basic question is: Are there other varieties of statements of this type? 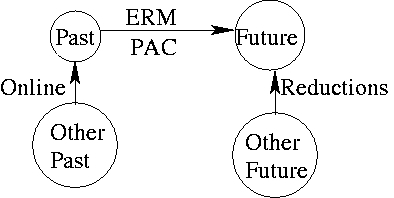 Avrim noted that there are also “arrows between arrows”: generic methods for transforming between Past->Past statements and Past->Future statements. Are there others? Is the Goal Understanding or Prediction? Steve Smale and I have a debate about goals of learning theory. Steve likes theorems with a dependence on unobservable quantities. For example, if D is a distribution over a space X x [0,1], you can state a theorem about the error rate dependent on the variance, E(x,y)~D (y-Ey’~D|x[y’])2. I dislike this, because I want to use the theorems to produce code solving learning problems. Since I don’t know (and can’t measure) the variance, a theorem depending on the variance does not help me—I would not know what variance to plug into the learning algorithm. “Operative” mathematics helps you make predictions about the world. A strong example of operative mathematics is Newtonian mechanics in physics: it’s a great tool to help you predict what is going to happen in the world. In addition to the “I want to do things” motivation for operative mathematics, I find it less arbitrary. In particular, two reasonable people can each be convinced they understand a topic in ways so different that they do not understand the viewpoint. If these understandings are operative, the rest of us on the sidelines can better appreciate which understanding is “best”. Machine Learning is a field with an impressively diverse set of reseearch styles. Understanding this may be important in appreciating what you see at a conference. Engineering. How can I solve this problem? People in the engineering research style try to solve hard problems directly by any means available and then describe how they did it. This is typical of problem-specific conferences and communities. Scientific. What are the principles for solving learning problems? People in this research style test techniques on many different problems. This is fairly common at ICML and NIPS. Mathematical. How can the learning problem be mathematically understood? People in this research style prove theorems with implications for learning but often do not implement (or test algorithms). COLT is a typical conference for this style. Many people manage to cross these styles, and that is often beneficial. Whenver we list a set of alternative, it becomes natural to think “which is best?” In this case of learning it seems that each of these styles is useful, and can lead to new useful discoveries. I sometimes see failures to appreciate the other approaches, which is a shame. This is an attempt to organize the broad research programs related to machine learning currently underway. This isn’t easy—this map is partial, the categories often overlap, and there are many details left out. Nevertheless, it is (perhaps) helpful to have some map of what is happening where. The word ‘typical’ should not be construed narrowly here. Learning Theory Focuses on analyzing mathematical models of learning, essentially no experiments. Typical conference: COLT. Please comment on any missing pieces—it would be good to build up a better understanding of what are the focuses and where they are.